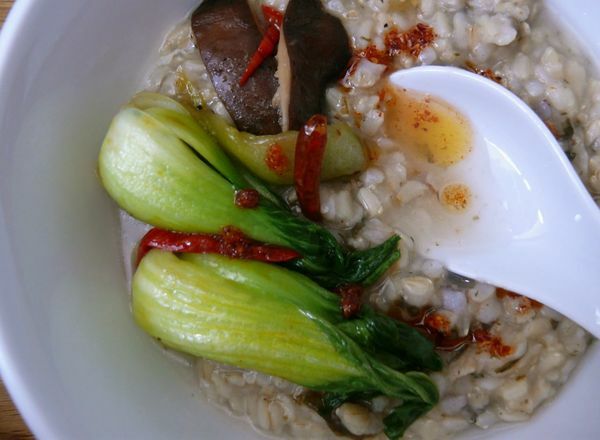 congee is one of the few things that i've enjoyed for years in restaurants and craved regularly, but never attempted to make at home. even though i have a rice cooker at home that makes congee to the perfect consistency without me having to do much more than to push a button. i finally pushed that button–after adding a few things to the rice cooker that would add some subtle flavour to the congee. i threw in 3 dried shiitake mushrooms, a pinch of dried seaweed, and the white of one scallion stalk. you could use the same ingredients as a loose recipe if you care to take a stab at this yourself, but really, anything you use to flavour a broth would probably work well. while it cooked, i stir-fried some chilies, fresh shiitakes and bok choy to have with my soup. its no replacement for the fried dough fritters i dunk into the congee i eat in restaurants, i'll admit. but the important thing is that i have chilii oil on hand to drizzle on top, just like always. Homemade congee is the best. Better than any MSG-soaked restaurant goop. But yes, the dough fritters are irreplaceable.